As we get older, especially beyond the age of 60, there is one more possible ailment that you should be aware of. This is particularly true if one sits for long periods of time. Most of us think that DVT (Deep Vein Thrombosis) is just a condition that can strike only during long plane flights. However, having a deep blood clot is a potentially very serious condition because part of the clot can break free and cause a blockage in your lungs or brain, which can result in a stroke. Visit your physician. An ultrasound can locate the clot and also determine if you have diminished blood flow. An MRI or veinography may also be necessary for further diagnostic help. Don’t sit or be immobile too long, whether it is stuck on a plane or in bed. Try and get up and move around, or at least move your legs. If getting up is not an option, raise and lower your legs; lift your heels and alternately lift your toes to cause more circulation in your feet. If you had a recent surgery, get moving as soon as possible. Use compression stockings, drink lots of water, and avoid alcohol in the short-term. Sleep with your legs slightly elevated (place on top of a pillow). Long-term, increase your exercise level (swimming and cardio), do more walking, lose weight, stop smoking, and talk to your doctor. There are also many foods that are excellent for your heart and circulation: olive oil, fish oil, lots of fruits and vegetables, along with a low-fat, high-fiber diet. This was a fairly dry topic. What better way to end it than using a fish picture. This juvenile barracuda was photographed off of Belize. He was only ~2-3 feet long. 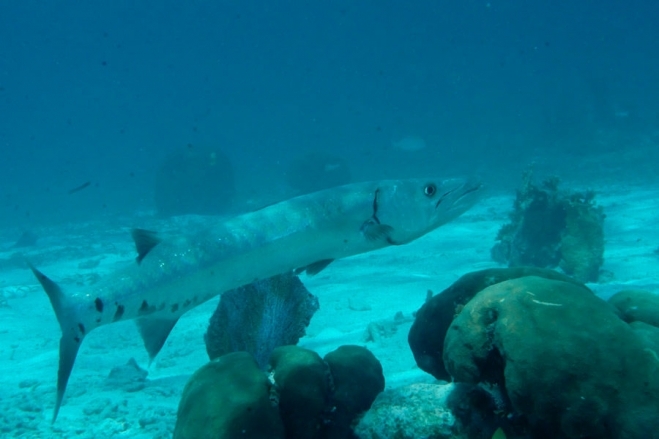 Although his teeth are sharp and he looks fierce, these smaller barracudas feed on smaller fish and are afraid of divers approaching too closely. They are very curious and will follow a diver just out of curiosity. There is not much color in this photo because he remained outside the range of the strobes, which on that day was approximately 5 feet.